Charles Martel (ca. 688-741) - Charles "The Hammer" Martel could rightly be considered the "Savior of Europe". After the conquest of much of Hispania, the Saracens (Saracen was a medieval term often used to describe Muslims) crossed the Pyrenees and entered the Kingdom of the Franks. The ruling dynasty of the Franks were the Merovingians. But Martel was not a Merovingian, he was Mayor of the Palace, which was kind of an administrator for the king. To complicate matters even further, Martel was not even a legitimate son of his father, Pepin of Herstal. He had been born to Pepin's mistress, Alpaida. As such, he had no claim of inheritance from his father. However, Charles did have a few things working in his favor. First, Pepin's legitimate sons had all predeceased him by the time he died in 714. So he had no legitimate heirs, opening the possibility that Charles might make a claim for his father's inheritance with no one else to challenge him. More importantly, he was a fierce warrior. And in that time, success on the battlefield carried a lot of weight. The Merovingian Dynasty had become weak, and the kingdom fell into a civil war in 715. Charles Martel was from the realm of Austrasia in the northeast part of the Frankish Kingdom, and fought for his realm. The Merovingian ruler of Austrasia was Chlotar IV. Martel was successful in defending the region, winning the Battles of Amblève, Vincy and finally Soissons. By 718, the war ended in victory for Austrasia and Chlotar IV technically became king, but he was no more than a figurehead. 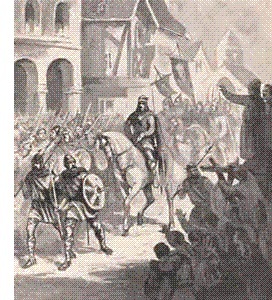 Charles Martel more or less made himself Mayor of the Palace and was the real power behind the throne for the rest of his life. However, he did not actively seek to overthrow the Merovingian line; but as it turned out, events dictated that he step in and eventually replace the ruling dynasty. 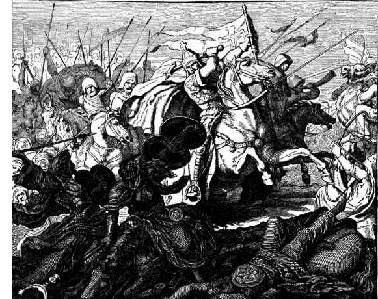 Foremost among those events was the aforementioned invasion of the Saracens. When Chlotar died ca. 721, Martel had full control of the Frankish Kingdom. In fact, his son, Pepin (the Short) would become the first Carolingian king of the Franks. And his grandson, Charlemagne, would become emperor. But back to the Saracens...at the time of their invasion, most of Europe was weak and in disarray. Only the Frankish Kingdom had the strength to muster a legitimate defense; and even that was questionable, coming off the civil war between the waning Merovingians and the rising Carolingians. But Charles recognized the Muslim threat and managed to unite most of the kingdom under his rule. He raised a powerful army and pushed the Umayyad Caliphate back across the Pyrenees (see Battle of Tours below). After the famous battle, Martel was aware that the Saracens might return. And sure enough they did (although not to the same extent). Abdul Rahman's (the Muslim commander at Tours) son tried a different tactic than his father. Rather than an all-out assault on the Franks, he tried to gradually encroach upon their territory, taking the southern town of Narbonne in 736 and Arles the following year. But Martel had updated the Frankish military in the interim. He added cavalry (his army at Tours consisted entirely of infantry). This allowed for much more rapid response to enemy attacks and the Moors were quickly driven out of southern Gaul. Martel spent most of the rest of his career keeping the Saracens out of Gaul in the south and the Frisians and Saxons at bay in the north.